Muslim People: . :: Happy New Year 1432 H ::.
.:: Happy New Year 1432 H ::. As Salam Alaykum to all my brothers & sisters in Islam..
Maybe we are not need to wait for 01 of January-2011 to release our resolution and start over. For us as The Muslims, Month Muharram is the most meaningful moment and the right time to start a new Year with new spirits. 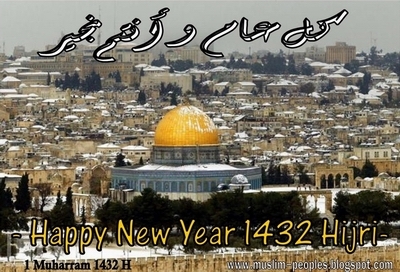 Well, Muharram is actually a New Year in Islamic Lunar Calendar where Muharram is the first month. Its date compared to Gregorian Solar Calendar migrates over time since the Islamic Calendar year is 11 or 12 days shorter than the solar year. 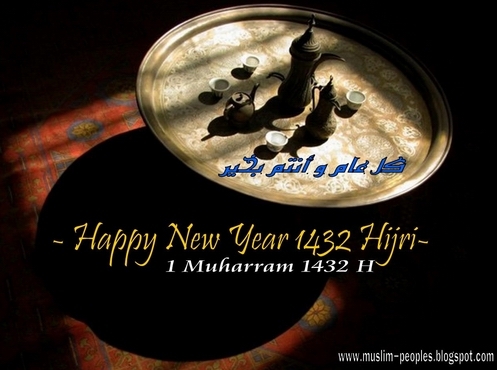 So as the Muslims celebrate this day which symbolizes the two happy event in Muslims' life, which apart of the start of a new year, it also coincides with the Prophet Muhammad's journey from Makkah to Madinah on the 1st of Muharram 622 AD or named by Hijrah. And let's take a lesson from Hijrah of our Prophet Muhammad and from Muhajir and Anshor, make this moment to improve our iman and our deeds, untill be better than the last year, because Hijrah not only a journey from one place to another place, but hijrah it's mean to journey from badness to goodness, from maksiah to tho'ah, and also Hijrah from days filled with sadness to the day filled with happiness, with new smiles and full of optimism.